Gerontology is the study of aging and older adults. This is a critical ﬁeld of study, as life expectancy increases and members of the baby boomer generation turn 65. The Centers for Disease Control and Prevention reports that by 2030, 1 in every 5 Americans will be an adult over the age of 65. As advances in health care have evolved to manage chronic disease, people are living longer lives and often doing so while managing various health conditions. This lends itself to a complex set of dynamics facing older adults and their caregivers, and available social services have not necessarily kept pace with emerging community needs. Working with older adults provides exposure to many social service areas such as access to health care, mental health care, transportation, and housing. Skillful social workers understand how these services interlink, and quickly pinpoint the gaps facing older adults and their caregivers. Students at the University of Mississippi pursuing an undergraduate degree in social work have the opportunity to hone their skills while working with older adults in several gerontology classes taught by Dr. Jo Ann O’Quin, Professor Emerita of Social Work. In these service- learning courses, students study aspects of aging, along with family and caregiving issues, dementia, and end-of-life care, and apply skills that will serve them in any area of clinical or professional practice. “The design of these courses recognizes community-based organizations as full partners in the teaching and learning process,” explains Dr. O’Quin. “One class session featured a panel of older adult guest professors who shared their experiences and perspectives with the students.” Students are expected to volunteer a minimum of 10 hours per semester at a community partner organization. 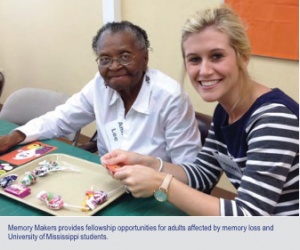 In Oxford and Lafayette County, these community partners include Memory Makers Respite Day Program, as well as several area nursing homes, assisted living communities, and hospices. SW 326: Gerontology: Social Welfare Aspects explores the biological, psychological and social aspects of the aging process and their impact on individuals, caregivers, families, and society. Students explore how the aging process impacts quality of life, and how caregivers and living environments can foster a sense of independence throughout that process. As they study gerontology, students familiarize themselves with the social services available to older adults, and the social issues that stem from individual and community responses to an aging population. As a service-learning course, SW 498: Special Topics on Aging: Caregiving, Dementia, and End- of-Life Issues is particularly innovative because it is offered as an online course. Students at the Grenada, Southaven and Tupelo campuses have the opportunity to seek out their own service placements to fulﬁll the service component of the course. Identifying and building a relationship with a community partner is a valuable experience for future social workers, psychologists, nurses, physicians and related professionals, as well as elder law accountants and lawyers, who will one day need to broker services for their clients. The service experience also provides continuity between the face- to-face and online course delivery, while retaining a powerful learning experience for the students. 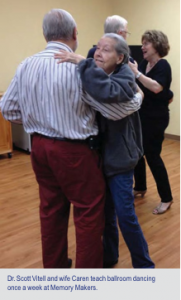 SW 575/PSY 575: Psychosocial Aspects of Aging is a graduate level, intergenerational service-learning course that integrates current research on the biological, psychological, social, and behavioral aspects of aging with service experiences. As this course is cross-listed with psychology, students explore special topics pertaining to mental health and treatment. These service-learning courses have impacted students, faculty, and community partners beyond the semester they are taught. Many students have received letters of recommendation based on their hands-on service work, which speak directly to their skills and competencies as emerging practitioners. For her part, Dr. O’Quin has used these service- learning courses as the basis for numerous academic publications, including articles and book chapters. Finally, many students are so impacted by the experience that they continue volunteering at their service placement, thus strengthening the community partner organizations and enriching the lives of their clients.